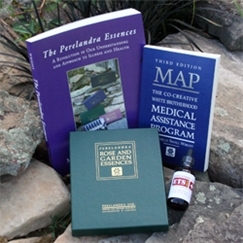 Basic Health Care Kit - Perelandra Ltd.
By using the Perelandra Essences and MAP, we can take control of our health care. One of the things we like about the Health Care Kits is that they offer a comprehensive program that can be entered through three different doors. A person can choose to start MAP. Or start by learning to use the Essences. (And, you can choose how many sets of Essences you want to start with.) Or start MAP and use the ETS for Humans right off the bat. Your Basic Health Care Kit is exactly what I use to cover my basic health care needs in a daily way. I agree with your premise that if someone wants to just get all the things to support their (and their family's) health, this is what to get. I deal with my ongoing health issues via regular MAP sessions and Essences. If a health crisis arises, I take ETS and then do a MAP session, using Essences before and after the MAP session. I carry ETS with me at all times... in my purse, my car, and in every room of the house, literally. Anyone who hangs out with me gets a dose of ETS if they express difficulties they are having. Any disruption in balance (allergies, headache, emotional upset, stress, bad news, exhaustion, etc), we reach for the ETS. I also use ETS daily in my business, and with all my clients.